A single light bulb in your home, depending on type, can burn between 7 watts (some LEDs and CFLs) and 100 watts (a 100W incandescent) of electricity. One light bulb. Our basement has six light fixtures, as does the master bathroom. My office has three (in a ceiling fan), as does our bedroom and the bedroom of our children. I count seven fixtures in our dining room. So, let’s say that each of those fixtures is holding a typical 60 watt light bulb. (I won’t count the other rooms in our house, just for convenience.) I leave for the day and fail to turn off any of these bulbs, even though it would have taken me thirty seconds to do so. That’s 28 light bulbs, at 60 watts each, for nine hours. That’s a grand total of 15,120 watt-hours, or 15.12 kWh. Our electric company charges us an average of $0.14 per kWh during daytime hours (rates vary throughout the day). That’s $2.12 wasted, something that could have been alleviated with just a few seconds of turning off light switches. 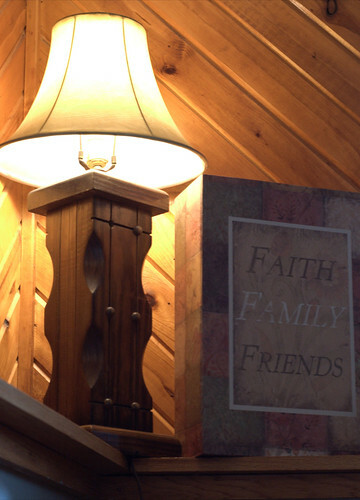 A great example of this is the lamp pictured above. It’s sitting on a high shelf in a family room where it’s inconvenient to turn it on and off. Sometimes, when the family is in there playing a board game or something, it’s quite useful to turn this little lamp on. The light from the lamp plus the reflected light from the corner in which it sits can help quite a lot with lighting the room. Let’s say that lamp has a 60 watt bulb in it. If you’re in the family room for an hour, that bulb might gobble down a cent worth of electricity, which isn’t a big deal at all. But what if everyone goes to bed and forgets to turn off that light? No one goes into the family room in the morning, either, or the next evening. In fact, no one spots it for another 48 hours. During that period, not only has the light eaten up about $0.50 in electricity directly, but it’s also added to the heat in the house. In the summer months, it can provide a subtle change to the temperature of the home, which of course has a small cost, too. “It’s just fifty cents,” you might say. That’s true, but a pattern of leaving lights on means that this pattern is repeated throughout your home. For example, if we accidentally leave the two lights on in our laundry room/crawlspace, we might not notice them for a day. It’s easy to do because the crawlspace is in a corner of the basement that we only go into if we’re back there specifically for laundry. That’s just energy down the tubes for no reason. Our children often leave the lights on in the family room and sometimes in the guest bedroom (our kids like to go in there sometimes to play). Every once in a while, lights stay on in the kitchen if someone goes upstairs without realizing that everyone else is already in bed. The solution is to simply get into the habit of turning off all the lights in a room when you leave it. If you come back, you can always turn on the necessary lights. There’s no reason to burn the energy to light up an unused room. On top of that, there’s the heat that the lightbulb produces, which has a small effect on the temperature of your home (and not an effect you want in the summer). A simple flip of the switch fixes that.